Stuck in Kenya • Salt Lake City imam may have been put on the U.S. "no-fly" list. Trent Nelson | Tribune file photo Imam Yussuf Abdi at the Madina Masjid Islamic Center in Salt Lake City, Friday March 10, 2017. 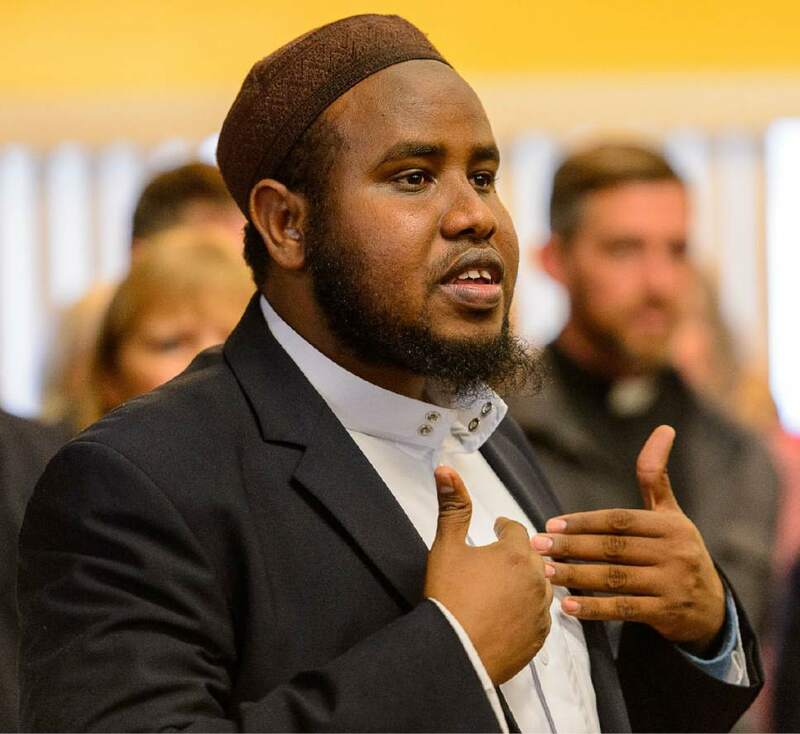 Trent Nelson | The Salt Lake Tribune Imam Yussuf Abdi speaks at a news conference where religious and community leaders gathered at the Madina Masjid Islamic Center in Salt Lake City to show support, Friday March 10, 2017. Lawyers filed an emergency petition Friday, asking to bring home to Utah a Muslim leader  and an American citizen  stranded in Kenya this week after he was barred from boarding a return flight. 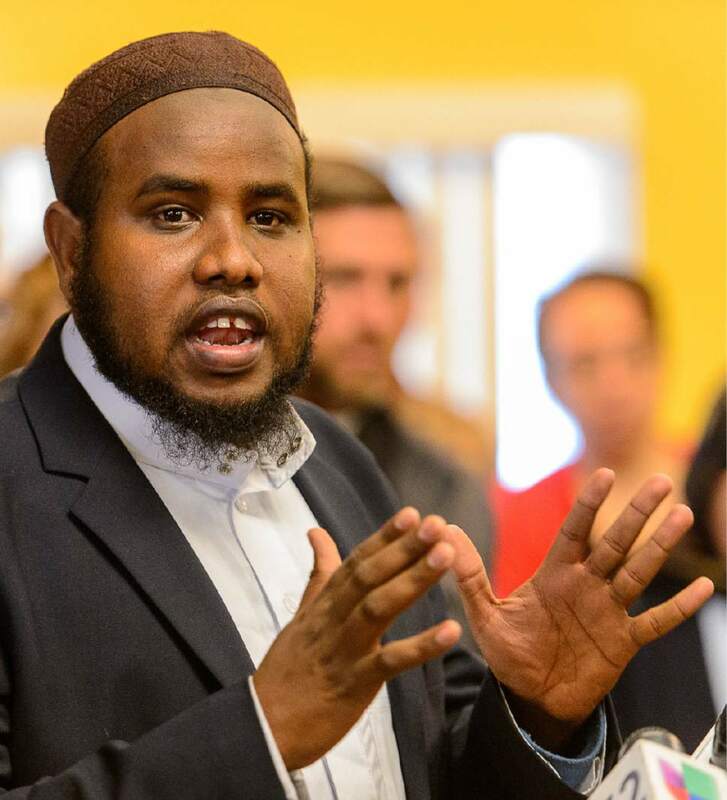 The Council on American-Islamic Relations and the Refugee Justice League of Utah argue in a joint complaint that there is "good evidence" Yussuf Awadir Abdi, imam of Salt Lake City&apos;s Madina Masjid Islamic Center, was put on the federal government&apos;s no-fly list after he left the United States and was blocked from re-entering. He has no criminal record, though his travel has been monitored and restricted in the past. "They&apos;ve essentially exiled a U.S. citizen," said attorney Jim McConkie, co-founder of the justice league. Abdi had traveled to Kenya to pick up his wife and five children. While his family was allowed on the plane Wednesday, Abdi was pulled aside by officials at Jomo Kenyatta International Airport. Qatar Airlines employees told him he couldn&apos;t board because the U.S. wouldn&apos;t accept him, McConkie said. Abdi, though, has been an American citizen since 2010, living in Utah for the past six years. And Abdi&apos;s wife and two of his children have visas; the other three kids are legal immigrants. They all stayed in Kenya with Abdi and will try to leave the country this weekend. McConkie said a judge was considering the case Friday evening and was expected to release a ruling in the next two days. The petition calls the situation "an injustice of historic proportions" and a violation of constitutional rights. President Donald Trump&apos;s recent immigration and refugee executive orders  that sought to temporarily limit travel to the United States and seem to fulfill his campaign promise of a "Muslim ban"  have been blocked by the courts, so it&apos;s unclear why Kenyan officials kept Abdi from his flight. Kenya is also not one of the seven Muslim-majority countries targeted by Trump. Still, the president&apos;s action should have no effect on Abdi because he is a citizen. "This is unacceptable," said Noor Ul-Hasan, a Muslim community leader and activist in Utah. "You cannot give somebody citizenship and then not give them the rights that go along with it." Ul-Hasan believes Abdi was barred from his flight because he is an imam. Before he left, she warned him not to go for fear of potential prejudice that may hamper his return. When he decided to go anyway, Ul-Hasan advised him to keep a low profile. "Speak English with your kids so you don&apos;t draw attention," she said. "Dress Western. … Make yourself less visible." In 2005, Abdi left a refugee camp in Kenya with his grandmother, sister and brother. His mother remains in that country  Abdi has been working to get her to the United States, too  and his father was killed in a civil war in Africa. Abdi&apos;s temporary visa in Kenya will expire shortly, he warned McConkie. Abdi, as the leader of a mosque, was expected to lead members in prayers during the last 10 days of Ramadan, which started Thursday. Though he has a substitute, "those are the most special prayers that you don&apos;t want to miss," Ul-Hasan said. "That&apos;s why he was coming back." A Kenyan couple who attended services at the mosque were detained by U.S. immigration officials in Salt Lake City in March. They agreed to exit the country after losing an appeal of their asylum request. Abdi had talked with news media during the deportation negotiations. At the time, he feared the government was targeting Muslims. He said: "We are scared now."